We all have that one love: the first one, the realest one, the final one. Sometimes if you get really lucky, there’s someone who ends up being all three and everything more in your life. The song “Marry Me” by Thomas Rhett is about that kind of love, but there’s a twist. The song’s title may suggest that this is a standard love song where the the guy asks the girl to marry him, but in actuality this is a song about a guy who loves a woman who is NOT marrying him. She is marrying someone else and he can’t hide the emotional turmoil he is going through. 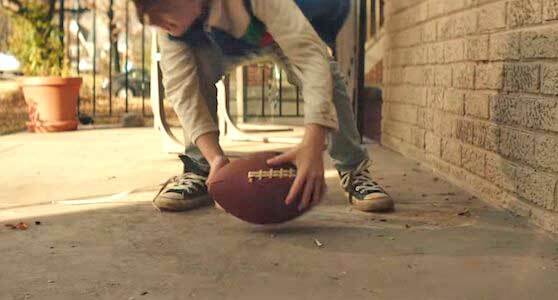 Nothing more All-American than a kid in chucks with a football. The music video follows the relationship of a boy and a girl than spans the course of over twenty years, while also cutting to shots of Thomas Rhett playing his guitar in a dark, sunlit room. It starts out with the young girl pretending to get married as the young boy watches from her living room window. The boy is wearing black chucks and we see him smile, showing his first hint of affection towards the girl. He then runs off to play football which transitions us to the two in high school, where the boy is on the high school football team. She is cheering him on from the stands, wearing a tie dye shirt that has his name on it, and again he shows the camera a subtle smile. They then head out to the local burger joint, and actually come so close to kissing before they’re interrupted by one of his teammates. The kiss doesn’t happen, and the video jumps to the girl’s engagement party. The boy is there, but he is not the one she’s engaged to. We see how heartbroken he is that she’s getting married to someone else, and then the video cuts to the day of the wedding. The guy arrives with a present wrapped in her old tie dye shirt, but he can’t handle being there, so he bails. He heads to the same burger place from earlier and drinks alone. The girls wedding unfolds, but she ends up leaving her fiance at the altar and heads to the burger place to be with her true love. The boy leaves the girl’s house knowing that he will be the one she marries for real. It’s a very heartwarming video, although it does feel like it’s missing a scene or two, perhaps on showing us why the two didn’t end up together in the first place. However, this can largely be attributed to the fact that the song is so short and doesn’t offer enough time to flesh out the story. Overall though, this is a great video that tells a very sweet story and fits perfectly with the song. The young boy wears black high top chucks in the music video. Click on the links below to get a new pair of chucks to wear at your wedding.